Pedal across the Golden Gate Bridge on this scenic San Francisco bike tour, a family-friendly adventure bringing you up close to the city’s most famous landmark. Follow a guide from Fisherman’s Wharf through Fort Mason, the Marina and the Presidio, and admire incredible views of San Francisco Bay as you ride across the Golden Gate Bridge. End by exploring Sausalito or Tiburon at your leisure before biking or taking the ferry back to San Francisco. Keep the bike for 24 hours to see all the San Francisco sights you wish! Starting at Fisherman’s Wharf in the morning or afternoon, get outfitted with your bike and helmet, receive a safety orientation, and get an overview of the bike route to Sausalito and Tiburon, in case you want to continue riding after your tour. Your bike comes fully equipped with a helmet, lock, bike bell, handlebar bag, rear rack for bags and purses, custom city map and detailed route suggestions. The tour is 8 miles (13 km) and lasts between 2.5 and 3 hours; you’ll make some informational and photo stops along the way, so actual ride time is about 1.5 hours. Following your guide, set off on a mostly flat bike path through the Marina, past the Palace of Fine Arts and Crissy Field and through the historic Presidio. Hear stories about the history of San Francisco and the Golden Gate Bridge and capture the scenery on camera during rest stops. 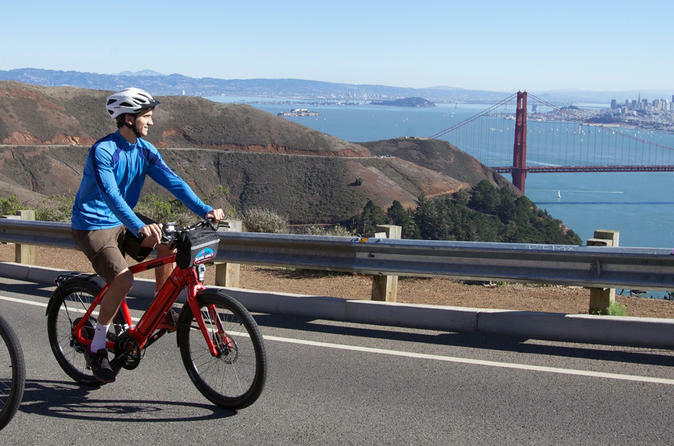 Savor the excitement as you pedal onto the Golden Gate Bridge! Cycle along a designated bike path and pause to soak in a panorama of San Francisco Bay, dotted by Alcatraz Island with the stunning San Francisco skyline in the distance. Reaching the end of the bridge, cruise 10 minutes downhill into the charming bayside town of Sausalito, where your tour concludes. Here you can lock up your bike, enjoy a meal at a waterfront restaurant, pop into the charming boutiques scattered throughout town, or continue riding up to Tiburon, a nearby peninsula town with more fantastic dining, shopping and views. Ride back to San Francisco whenever you please, or take your bike onto the ferry and cruise back to San Francisco on what’s considered one of the most scenic ferry rides in the world. Return your bike upon arrival, or take advantage of the 24-hour rental to cross off more San Francisco attractions on your sightseeing list.